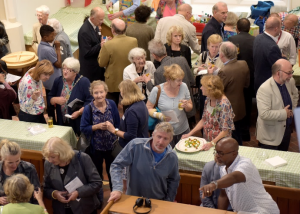 On Tuesday, 18th September, St Michael’s church building was the venue of a Celebration and Thank You event. Thank you to all who helped and thanks be to God. After many years of planning, of fundraising, of careful drawing up of detailed plans and significant investment of time and energy by so many people, the major building project, known as PRISM, had been completed. The church building closed for approximately a year had been preserved, restored and improved; the scaffolding that had covered the church had gone; and the interior had been redecorated, with state of the art lighting and underfloor heating, new glass doors, an updated sound and visual system and many other improvements to produce a flexible and modern building fit for the 21st century. The Church had reopened in August but this event was to celebrate with and to thank all those who made it possible, the generous donors from within the congregation, former members and local residents, the grant giving bodies, including Garfield Weston Foundation, All Churches Trust, Morden college and Viridor Credits Environment Company but also those who had worked so hard on the project both within St Michaels and the key contractors and consultants, led by Robert Davies Of Thomas Ford, the project architect, and the principal builders, Fullers. Many of those were present at this very special evening. Robert Davies explained aspects of the project and we were able, through John Clark, to thank personally those who had donated or provided other support and, through Carolyn Watkins, to thank the list of contractors and consultants. And a very special evening it was. The church was packed as guests looked over the renovations and improvements inside, enjoyed delicious canapes, sweet and savoury, provided by Kim Causer and her team of cooks and helpers and sipped wine and soft drinks organised by Louise Dolan and Matt Hall. Christine May, mayor of Greenwich and other local councillors joined us, as too did Alastair Cutting, Archdeacon of Lewisham and Greenwich, who closed the evening with a prayer and brief address, reminding us of St Michael’s unique status as have a spire called the Needle of Kent. And we were blessed with two sets of wonderful performances, organised through Michelle Thornhill. We enjoyed an enchanting performance by the Blackheath Childrens Choir, our very own local choir, funded to teach children to sing and enjoy church music. Then we were entranced by the Lewisham and Greenwich NHS Trust Choir who are comprised of medical staff and administrators singing part time to raise money for their respective charities. They have been very successful, you may have seen them on TV, or at ON Blackheath or Glastonbury. Anyone who has not seen the church in all its renovated and improved glory is invited to come and see the improvements. And thank you again for all those who have given, who have contributed, who have helped to making this project a reality. Thanks be to God for all the blessing that he has bestowed upon us to make this PRISM project a success. This article first appeared in the September edition of The Messenger under the headline “WHAT A CELEBRATION, WHAT AN EVENT, THANK YOU”.